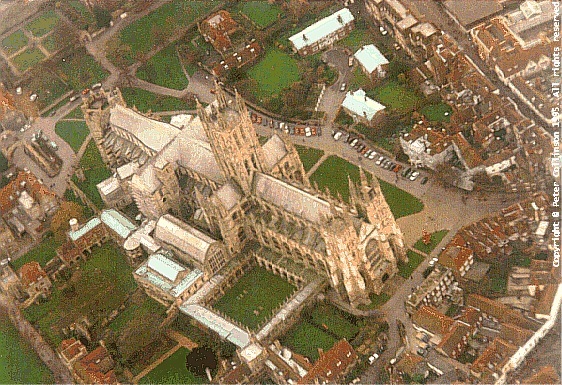 Canterbury is a mecca for tourists. Early tourists included Caesar J. and Claudius I. They came, saw and conquered. When they discovered all the deckchairs were taken, they disappeared back to Rome to change out of their swimming things. If you travel down to the Thanet where Claudius landed, you will find Richborough Castle. Here you can stand in a trench dug by an early tourist in AD44. Now there's boredom for you, no sand-castles, just a trench. The next set of notable tourists were four knights who came down from London to see the Cathedral and accidentally (honest guv) managed to terminally vandalise a prominent local resident, one Becket T. They claimed that the King had sent them. The King, one Henry II, said `Whoops, sorry'. Henry II re-invented tourism to show that he had no hard feelings. He came down by taxi from London and stopped at Harbledown, about 3 miles from the Cathedral. He walked barefoot from Harbledown into the city. As he said that he was Henry II and came from London, people thought that he had walked all the way. The news coverage of this simple act promoted the tourist trade for the City. People would come from far and wide to visit the Cathedral. Shops in Canterbury proceeded to rip them off by selling them cheap trinkets that they could attach to their anoraks to prove that they had been here. One prominent English Author, Chaucer G, wrote about such goings-on in an early printed tome. This is a rollicking good read and full of spicy bits. However, even though this is OLD ENGLISH LITERATURE, it's still covered by the Obscene Publications Act. As a result, most of the naughty bits are censored. A later prominent person was one More T., whose daughter was a local resident. More T. annoyed the King (a different king at this time) by starring in a play called `Man for All Seasons'. The King forced More T. to become a tourist attraction for a short time. The grand finale to the show was the separation of More T.'s head from the rest of his anatomy. This was done in London, because council there had bought the franchise for messy killings sometime before. To keep score, the good people of London placed the heads of their victims on spikes in the Tower. Anyway, More T.'s head didn't stay in London long, it made a final tourist visit to Canterbury, ending up in St. Dunstan's church. Where it is, to this day. Tourism continued to thrive until a certain other-other king, Henry VIII, decided that enough was enough. Basically, for several hundred years, all these tourists had been taking the gold leaf that was used to wrap their Kit Kat bars and sticking it on this big box in the Cathedral. Well, Henry decided that only royal Kit Kats could be wrapped in gold leaf. The tourist trade in Canterbury was finished. People were disgusted with the new silver paper around their Kit Kats. Henry nipped down the M2 one night and took away the big gold box too. He needed it to keep his ex-wives' jewel collection in. Loads of time passed and the tourist trade began to pick up. This was helped by one Stevenson. G. who came here as a tourist and also built a railway from Canterbury to Whitstable that was notable in that it had the first railway tunnel. Also, the first railway season ticket was sold there. This early railway was mostly worked by stationary engines that pulled you up to the top of the hill. The force discovered by one Newton I, gravity, was used to get you down again. The Canterbury Heritage museum has a locomotive called Invicta that was supposed to work the line. It didn't. It was designed as a tourist attraction. In 1944, the Germans were miffed that they couldn't visit because of all those Blue Birds Over the White Cliffs of Dover. They sent over a number of tourists in aeroplanes. They were so busy with their video cameras taking nice shots of `Canterbury from the Air' that they didn't notice that Franz had accidentally pressed the bomb release. `Whoops'. Luckily, they only managed to completely flatten the south end of the City. They missed the Cathedral. The demolition of the City was a lucky accident for a bunch of unemployed architects who proceeded to rebuild in that `English Brutal' style much beloved in the 50s and 60s. This has been knocked down in the last five years and replaced with buildings in the modern `Back to Basics' style. Pick a historical style, any style and build in it. In 1975(ish), Canterbury was pedestrianised to enable the tourists to walk about more freely. This was a GOOD THING. The council had planned to convert the Cathedral into a multi-storey car park so the tourists could park and visit the shops in the City. Luckily, this plan was dismissed, largely because the council had invented a Park and Ride scheme and wanted people to park outside the City walls. The City was pedestrianised, and all the real shops in Canterbury, the ones for the locals, promptly moved out of City next to Car Parks. The City is now filled with knick-knack shops all selling the same seven knick-knacks, fast-food restaurants selling slow food and Building Societies. We used to have loads of shoe shops but their owners all listened to `Hitch-hiker's Guide to the Galaxy' and went out of business. The City is now notable as a meeting place for French schoolkids who come in search of the elusive eighth knick-knack. They arrive in large coaches plainly marked `CARS' which must be an attempt to get cheap parking. Canterbury traffic wardens aren't fooled. Canterbury is a great place. Come in the first week of February, there are no tourists then. Come and walk around Canterbury, visit The Canterbury Tour.